UNITED NATIONS, February 24 -- With controversy revived about Sri Lankan war crimes including the murder of surrendering prisoners, Inner City Press on February 24 asked UN official Vijay Nambiar to explain his role in these "white flag" killings, and if involved Major General Shavendra Silva should be a UN Senior Adviser on Peacekeeping. 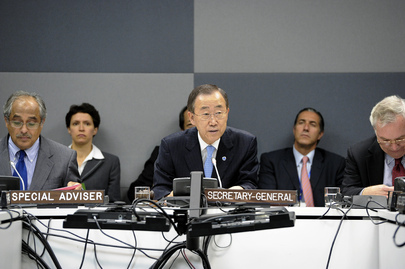 On camera, Secretary General Ban Ki-moon's deputy spokesman insisted that Nambiar would not answer the question. Nambiar said "if necessary" he would answer afterwards. Video here, from Minute 18:15. Inner City Press followed Nambiar who began that he has "problems with you saying I am involved in the genocide." He paused and noted, "Marie Colvin was involved in the same...now that she has passed away I would like to place on record my own" position, and "appreciation for the intrepidity with which she pursued her own vocation." She talked to me, you know that," Nambiar said of Colvin. Inner City Press asked, hadn't Colvin urged Nambiar to go witness the surrenders? Nambiar nodded yes. "I asked to go, twice I contacted [US diplomat] Bob Blake, the two of us were planning to go... the ICRC was not able to go by sea route. The Government refused to give us permission. There was no way we could just force our way in." With no witnesses, those who tried to surrendered ended up dead. Inner City Press asked Nambiar why he hadn't then spoke out. Nambiar continued with this story: "in the middle of the night, Marie called me, the two people, I've forgotten the names, one was on the Peace Commission, they wanted to surrender. We need to get assurance, free passage. I said OK, I'll do it. I took it up with foreign minster, the defense minister and the president. They would be treated like any surrendering prisoner, What happened after that, I couldn't..."
Again Inner City Press asked Nambiar, if you passed on the assurances, then were blocked from going to witness and those you assured got killed, why haven't you spoken out? Nambiar "subsequently said they could have been shot by own people. I am not prepare to hazard any guess. Even Basil [Rajapaksa], he also said that. It was mainly Gotabaya [Rajapaksa] and the President [Mahinda Rajapaksa]." Nambiar told Inner City Press, "I spoke with Palitha Kohona, the Foreign Secretary." Kohona, at least in May 2010, told Inner City Press a different story. Now with Major General Shavendra Silva, about whom Nambiar did not answer, barred from participating in the UN Senior Advisory Group on Peacekeeping Operations, it has been suggested that Permanent Representative Kohona replace him. We will pursue this -- watch this site.